We have decided to release a final update for the end of our campaign to summarize the topics that were brought up in the comments. Our goal is to give you an incentive to help us make it over the €100,000 threshold. What makes your software so special, can’t other companies also do what you are doing? Agencies have used our software existing interfaces in the online marketing field in order to post digital advertising in real-time. We have also made it possible to calculate the size ( in € ) of the account based on the number of live viewers, using our special software. This could only be copied if one also had access to our detectors that count the amount of onlookers. We also have the possibility to measure locations in real-time and to inform the advertisers about how many people are watching at a particular time, which target groups are present, and how well the advertising material is working. This means that we can adapt the content, the means of transport and the location to the target group’s interests. The software can be easily scaled, even without our own display screens. Why is your counting method working? With iOS it doesn’t work at all! 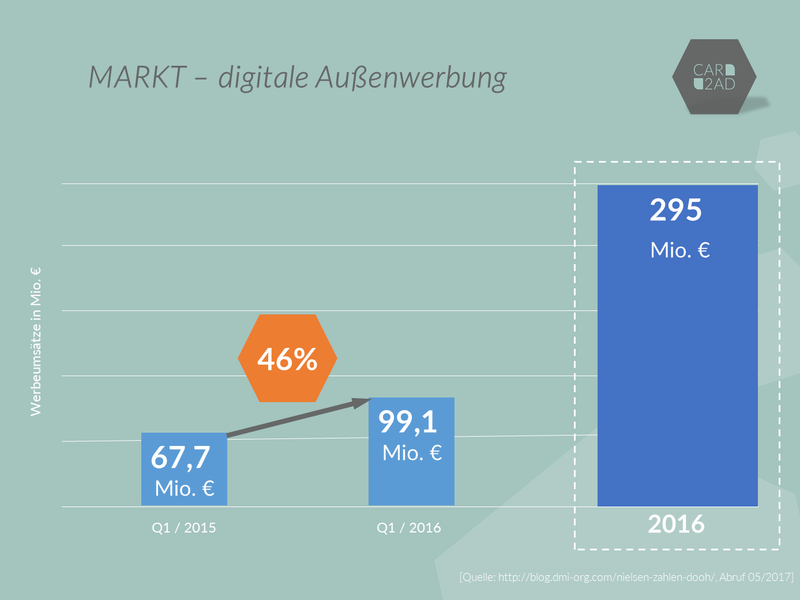 Android with 77.7% and iOS devices with 18.5% currently make up 96.2% of the smartphone sales in Germany. That’s why focusing on these two platforms is sufficient. We compared our Wi-Fi-based counting technique with the results of two rounds of manual pedestrian counters. We have achieved an accuracy of 97.2%. In order to remain on the safe side, we have communicated an accuracy of 90%. We assume on the basis of these measurements that the proportion of persons on iPhones with their Wi-Fi setting turned off is rather small. On Android phones, the Wi-Fi scan setting is, as a rule, enabled in order to improve GPS location detection. It seems that the majority of people leave this setting on as well. Should different facts emerge in the future, we will use other methods of measurement, such as mobile radio-based systems. You are still in your initial phase, why should I invest in you and not in an established start-up? We are more than a year front of the competition regarding the development of technology in the areas of both software and hardware - both are fully operational. Our concept has already been proven by use in various projects. Thanks to our business model, sales of our solution for smaller events have allowed us to generate revenue even at this early stage - last month, we exceeded our targets by 280%. Precisely because we are small, we can grow by leaps and bounds. This is often more difficult for larger companies. Why don’t you name the price for advertising? I want to know what you can earn with such a display. If we were to publicize the actual sales earned per display, we would solidify the price of our product and lose any opportunity to charge a higher price in the future. This would be extremely counterproductive. But what we can do is show the potential sales of comparable products on the market using published pricing lists. For example, Wall-Decaux makes €750 per day with their "Deluxenet" public video steles. As can be seen, the potential is extremely high. With mobile locations, the hotspot, and the live billboards counter, our product also goes far beyond Wall's range. If you sourceonlya little more than €100,000, then we are only financing your salaries, right? Our salaries are secured by means of research funding provided by the Federal Ministry of Transport and Infrastructure. The next round of funding would then be for a total volume of up to €3 million. We have also been requested by the ministry to apply for it. The funds from the Companisto campaign will primarily serve for the further development of the hardware and the construction of the fleet. Even with only €100,000, we can introduce the fleet into the market and have enough reach to further onboard media agencies. Hardware is complicated and risky, why should I invest in it? The CAR2AD Board is an exciting niche for us because it provides mobile billboard/poster advertising for the first time and allows for concepts in mobility to be financed that have been out of reach until now. Many of our USPs are found in our software. It can be installed on any display in the public space. 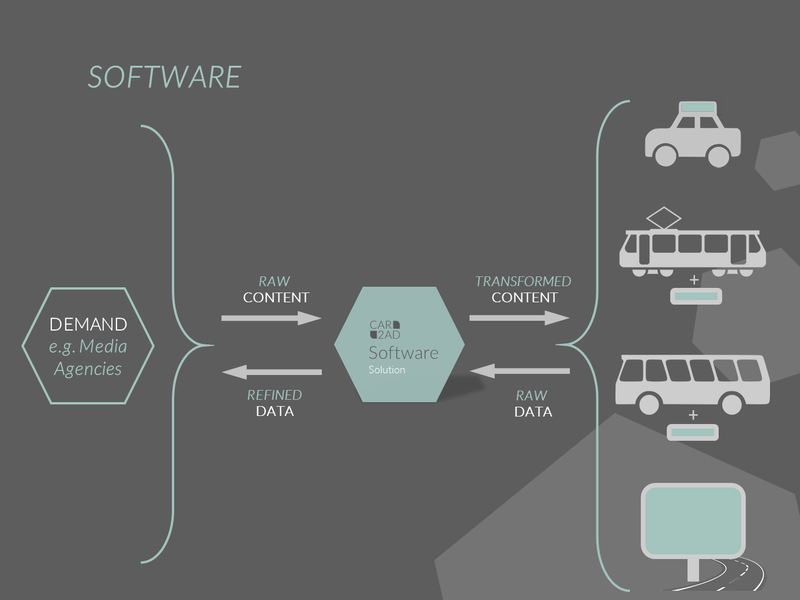 In the medium term, we also want to be present in the rail, bus and tram sectors, providing dynamic content. As conversations with companies have been taking longer than usual, we have limited our business plan cases that we can control almost entirely by ourselves. However, the potential is much greater, as we have seen in talks, for example, with municipalities that want to bankroll their own fleets. Hardware production is always associated with liability-related risks. How do you make sure your solution will work properly? We work together with a service company that has been developing digital signage solutions for the outdoors for several years and has been on the market in Germany for some time now. We benefit hugely from their know-how. Here, additional tests are being carried out in accordance with the CE standard. What do you do if car sharing doesn’t turn out to be like you planned it? You are dependent on others. The integration of car sharing was legally passed in Germany by the German Bundestag on March 30th, 2017 by the "Car Sharing Art CsgG). In many cities parking areas have been provided for car-sharing vehicles as well as mobility stations have been built to facilitate movement between bus, train, taxi, bicycle and car-sharing vehicles. More and more cities are expanding their own car sharing fleets, thereby increasing the overall amount of car-sharing vehicles in Germany. Surely not every car-sharing user wishes to drive around with a sign on the roof? We do not play the boards while a vehicle is being rented out, only when parked. We have seen that the availability (how close an available vehicle is in one’s vicinity) and how much the costs are - are the most important criteria for most users when it comes to deciding on whether or not they will use car sharing or not. In addition, we are currently having intense discussions with companies that could cross-financing their company fleets. The first pilot projects will take place this fall. We would like to take this opportunity to thank the Companists for their faith and confidence. We hope that we were able to illuminate some queries regarding our product in a bit more detail and motivate all those who have not yet invested in CAR2AD. We as a team are all behind our vision and look forward to taking the next steps, as well as future joint successes.